Ginger Luters is a California-based designer of knitted wearable art and a nationally known creative knitting teacher. She has an MA in Fine Art and taught knitting, weaving, and design classes at Saddleback College in southern California for 12 years. 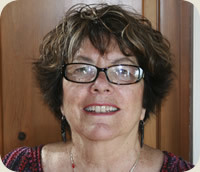 The author of the book, Module Magic, which focuses on the unusual designs and construction techniques for which she is known, Ginger designs for several knitting magazines and yarn companies.